As we all know that people and economy of Pakistan are badly affected by the power shortages, now government found a solution. For the purpose of saving diesel cost on diesel-operated water plants are now switching towards solar energy. This switching will minimize cost in long term. May be formation cost of solar conversion will raise the cost burden at the beginning, but in long term it will save farmers’ cost. In province of Punjab it is observed that this practice has been applied and being used to grow wheat, vegetables and dry fruits and sugarcane. You can grow many crops according to your area or hectares are available at your farm. This practice has been in practiced in Pakistan since April 2014. Out of 1.1 million agriculture tube wells, only 30% are being operated by electricity. In Pakistan energy crisis is very common and top listed issues. Our farmers have limited options for crops’ irrigation as initially farmers switched towards diesel instead of using electricity. 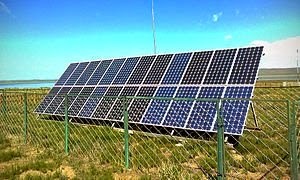 This is all because of electricity shortage and now switching towards solar energy is one more step toward saving cost. Solar energy will be used in Quide-e-Azam solar park up to 100MW in Punjab. This project will be taken place with the help of investment of USD33 billion. I think that this project is very beneficial for Pakistan as China will invest instead of borrowing from IMF or other financial institutions. If we see the solar development in public sectors it is all most equal to zero. All developments are being done in private sector. Hence, there is a great need to initiate more development in public sectors via foreign investments. If we shifted towards solar energy tube wells can be operated by it without using batteries. In Pakistan due to hot climate solar energy is very appropriate to be applied.